ALTHOUGH MORE WILL be coming later — reviews of two shows (Max Lazarus in Trier and Heinrich J. Jarczyk in Konigswinter) — I feel I ought to unload some of the images and memories of my trip before they are forever lost to a memory that grows more unreliable every day. Our flight from JFK to Düsseldorf by Air Berlin was uneventful, the journey a bit cramped for the seven or so hours of travel but the attendants pleasant and accommodating. At Düsseldorf, we were met by Heinrich Jarczyk and his wife Christiane who immediately whisked us away to their home just outside of Cologne in Bergisch Gladbach. There we freshened up, caught up on new and old news, enjoying a cold beer on their terrace overlooking a “homey” view of the neighboring backyards, all sporting well-kept lawns and gardens already in full bloom with spring flowers. During our stay with the Jarczyk’s, Heinz and I went into Cologne — always a fascinating city for me, my many visits always seeming to be too brief, the intervals too far apart. We went to the Wallraf-Richartz Museum where we saw a show of landscapes by Max Lieberman, Max Slevogt and Lovis Corinth. It is always an informative session to visit a museum with Jarczyk — who is well-versed in both history and art. During our viewing of the landscape paintings, we could discuss our favorites, point out our likes and dislikes, in the end often in full agreement as to the best work of each of the artists. We also learned from a wall-placard that Corinth, a follower of the post-impressionist artists, declared “realist” painters “Shtümpers” — i.e. “bunglers”. As we read, we looked at each other and almost said simultaneously, “So, now I know what kind of painter I am!” A good laugh and then on to an outdoor café, which was on a street facing the Cathedral. I still recall my first glimpse of the “Dom”, bathed in light when we arrived in the evening by train from Paris, now over twenty years ago. Largely untouched by our bombers during WWII, the Cathedral stands as an enduring testament to mankind’s almost super-human efforts to please the Creator…it is, in brief, a very beautiful structure. I was a bit saddened to see, however, that the large, paved area in front of the imposing front steps and façade is now filled not only with tourists but also by a noisy bunch of skate-boarders, whose antics threaten passers-by with bodily injury as well as several mimes begging attention and whatever coins might be dropped in a nearby box — at least the mimes were silent! Our next adventure began when our friends and oft-time fellow-travelers Jacky Sparkowsky and Jörg Iwan of Berlin came to pick us up for a five-day exploratory trip of the Mosel River. Famous for its vineyards that border the river — and its Riesling grape — we had hours of wine-drinking, sight-seeing, and conversation over our meals. 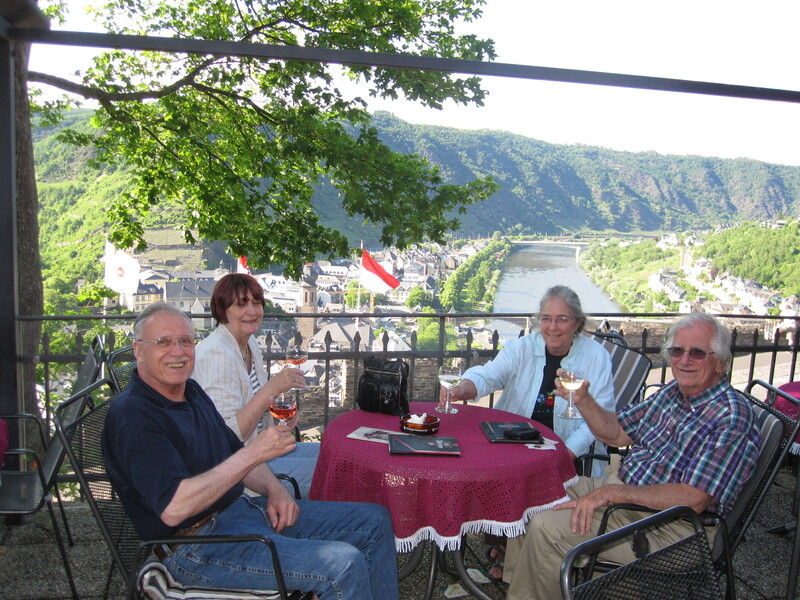 We split up our time between two hotels — one in Cochem, the second in Bernkastel — from which we made forays both up and down the river, visiting small towns nestled into hillsides, almost completely overtaken by vineyards that were just beginning to fruit. Our main purpose was to seek out cozy restaurants, friendly “weinstuben” (wine-bars) and interesting sites — which, of course, included castles, historic places, and Roman ruins. Our final destination was Trier — believed to be the oldest city in Germany — home of Constantine (eventual founder of Constantinople and largely known as the disseminator of Christianity throughout the Roman Empire) and site of the remnants of Celtic, Roman and, naturally, of early German civilizations. Though generally thought to be owed to the Romans, the existence of the grapevine in the region may have been already brought to the Mosel banks by the Celts — in any event, the grape and its products dominate the region, very nearly every square foot of every possible hillside that could be cleared given over to its cultivation. Thus far our travels, and now we are returned to Bergisch Gladbach, taking a small breather before we go to Konigswinter on Sunday to see Jarczyk’s exhibition at Haus Schlesien. THE OLD GREEK aphorism — I know the words are Latin, but the Romans lifted it from the Greeks who originally pointed out that “Art is Long (i.e. enduring)” and that “Life is Short” and, sorry, but I don’t know how to write it in Greek. I do know that the concept has certainly held up and, like much of the wisdom from ancient Greece, still solidly “true” today as it was then. In most instances — especially in the artworld — emphasis is put on the first half of the phrase, but at this time I’d like to focus on the “life is short” side of the equation and how the brevity of life — and how that affects art — was recently brought home to me once again. In early May, I went to see and hear Flamenco Vivo Carlota Santana — a Spanish troupe of musicians, singers, and dancers — at the Kaatsbaan International Dance Center in Tivoli, New York and then, a few weeks later, a musical program at the Salmagundi Club in New York City that featured the talents of a guitarist, a pianist, and a soprano (see my last blog at rjsteiner.wordpress.com or on www.arttimesjournal.com in which I describe the events of that evening). It was while watching the guitarists from the Kaatsbaan evening — Calvin Hazen and Ricardo Anglada — and then reinforced by the guitarist from the Salmagundi to-do — Francisco Roldán —that I recalled hearing Andrés Torres Segovia perform at SUNY New Paltz nearly fifty years ago. I was fortunate in having a front-row seat during the event, and remember intently watching that master’s strumming and fretwork. A guitarist of sorts — I never learned to read music but was part of a little band that used to play at Saturday night dances during which I switched from guitar to banjo to mandolin during our sessions, banging away as best I could and not half bad inasmuch I “played by ear” — the opportunity to watch Segovia play was something I just didn’t want to miss. Like I said, I was mesmerized by the way he used his hands, but at one point I recall glancing down at his feet — maybe during a pause between numbers or an intermission. I don’t remember what drew my eyes to Segovia’s shoes, but having that front-row seat with my eyes at stage level probably made the connection unavoidable. I mean, there they were, right before my eyes! They were probably patent leather — but scuffed, heel-worn, the leather creased from age — I recall thinking at the time that they could not last him very long, that they were destined soon for the dustbin. Once Segovia picked up his guitar to play once again, my eyes were drawn from the shoes back up to the man, to his hands. Somehow, shoes and hands merged in my mind, how both were inescapably subject to time and extinction, both destined to return to dust. How long before those hands would cease to strum and finger the frets? Vita Brevis. And how, once claimed by death, could the skill of those hands be passed on? Some years later, an artist friend of mine, Eduardo Chavez, gave me a small etching of Segovia, the guitarist focused, hunched over his guitar, and wearing a similar pair of shoes that looked worn, creased, well-broken-in. Chavez’s image is arresting, each time I see it vividly bringing back the day I saw Segovia live on stage. Segovia died in June of 1987, his fingers at rest forever. And how about Chavez’s hands? He died in 1995. Those hands that etched, that painted, that drew? How can the hidden knowledge of what an artist’s hands “know” be passed on to young artists? Both Segovia’s and Chavez’s hands are no more. Vita Brevis. And how soon before the hands of Hazen and Anglada and Roldán are stilled? And what of the feet of the flamenco dancers and the voices of the singers in the Santana Group? Or the voice of the soprano Gretchen Farrar, or the fingers of the pianist Alexander Wu, or the hands of the painters Richard Schmid and John Traynor at the Salmagundi — what about them? Vita Brevis. Oh yes! Life is short and though the art of these artists may be “longa” and survive time, never again will those hands, those feet, those voices, those talents survive the span of a human life. Segovia’s shoes…alas! You are currently browsing the Raymond J. Steiner's Blog blog archives for June, 2010.